Acknowledged author wrote The Law of Journalism and Mass Communication (Sixth Edition) comprising 704 pages back in 2017. Textbook and etextbook are published under ISBN 1506363229 and 9781506363226. Since then The Law of Journalism and Mass Communication (Sixth Edition) textbook received total rating of 3.5 stars and was available to sell back to BooksRun online for the top buyback price of $60.04 or rent at the marketplace. 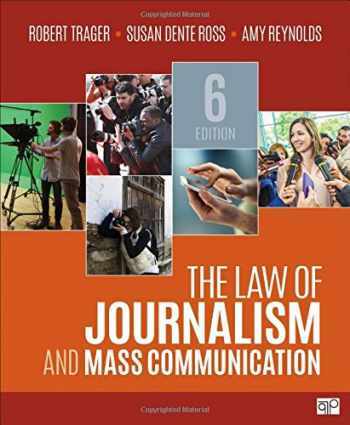 The Law of Journalism and Mass Communication, Sixth Edition, by Robert Trager, Susan Dente Ross, and Amy Reynolds offers a clear and engaging introduction to media law with comprehensive coverage and analysis of key cases for future journalists and media professionals. You are introduced to key legal issues at the start of each chapter, building your critical thinking skills before progressing to real-world landmark cases that demonstrate how media law is applied today. Contemporary examples, emerging legal topics, international issues, and cutting-edge research all help you to retain and apply principles of media law in practice. The thoroughly revised Sixth Edition has been reorganized and shortened to 12 chapters, streamlining the content and offering instructors more opportunities for classroom activities. This edition also goes beyond the judiciary―including discussions of tweets and public protests, alcohol ads in university newspapers, global data privacy and cybersecurity, libel on the internet, and free speech on college campuses―to show how the law affects the ways mass communication works and how people perceive and receive that work.